One of the pieces created by Rezgar Mamandi. After finding Mannea pottery artifacts at archaeological sites in his hometown of Rabat in the northwest of Kurdistan in Iran, Rezgar Mamandi discovered his passion for ceramic art. His formal studies in ceramic art technique were in Turkey. 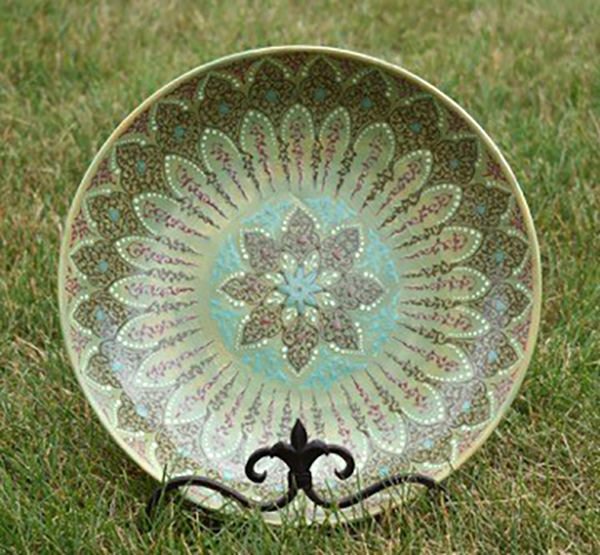 Now Mamandi creates Manna pottery, decorative and functional ceramics reproduced from 7th century Mannea Art originals. With hand-painted figures, patterns, shapes and colors, each piece is one-of-a-kind with an ancient, yet contemporary look achieved by using lead-free, high-fire oxidation glazes.